Construction wise it looks really well made ! Aesthetically though I'm not too keen. It looks like a big plain lump imho. I have to agree that the plywood is not really my cup of tea either. Maybe because it “hides” your workmanship in a way?! What did you use as a finish on the plywood? Will be interesting to see how it holds up in the weather. I like the "clean" look, although I'm not wild about the plywood. I am concerned about a couple of things: (1) there does not appear to be any drain holes in the bottom door track, and if you're in Ireland, I'd think them to be essential; (2) it looks like there are no real footers. Your workmanship is very evident. That thing will withstand an earthquake! Very nice construction, even the short internal panel supports are tilted a little to drain any water that manages to get behind the ply. I'm with Sparky on this one, I love the clean look, however, I also like the plywood look. It's the design and the ply that combine to give it its clean appearance. 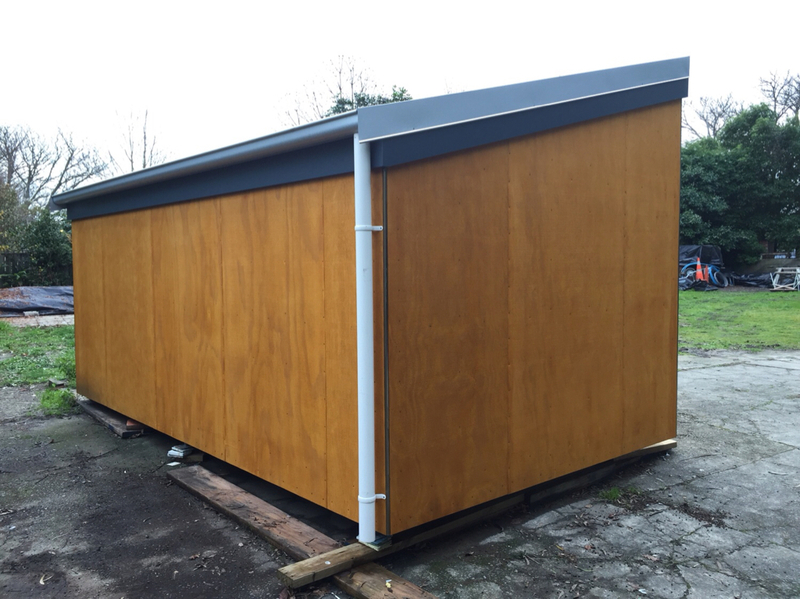 Here's the same style shed but with different materials and hardware used. Huge difference in appearance. I like that you did something different and doesn't look like a generic shed, you went for something nice and classy. I hate the wanna-be barn/cheesy look of almost all "off the shelf" sheds. The gutter/flashing work on the back looks slick too. Curious what kind of plywood that is and what you did to it. Also what was used for what looks like some form of corner bead. I like the clean design and construction too. Are there palm trees in Ireland? I like it. what finish did you use on the plywood? I did something similar for a friend but used Parklex. Similar outcome. I love the design and the tight construction details. Also love the plywood look- clean and modern. I can’t stand the faux barn/cottage look that most sheds have. I appreciate the honesty of the original design. It has a refreshing absence of pretentious embellishment. secondly, the "foundations" seem improbably insubstantial. Is the shed a transportable site shed with forklift loading/unloading capability or for mounting on some form of vehicular chassis/trailer etc? Love the design. I think all it needs is some more detail.